The walking and hopping SpaceBok robot is being tested now in ESA’s Mars Yard, in the Netherlands. Someday these little robots might help explore the moon, or Mars. Meet SpaceBok – a quadruped robot designed by a Swiss student team for future missions to the moon or Mars. Image via ESA. Maybe it’s because I’m yearning for this toy robot for my grandson as a holiday gift, or maybe it’s just because robots are cool and interesting. 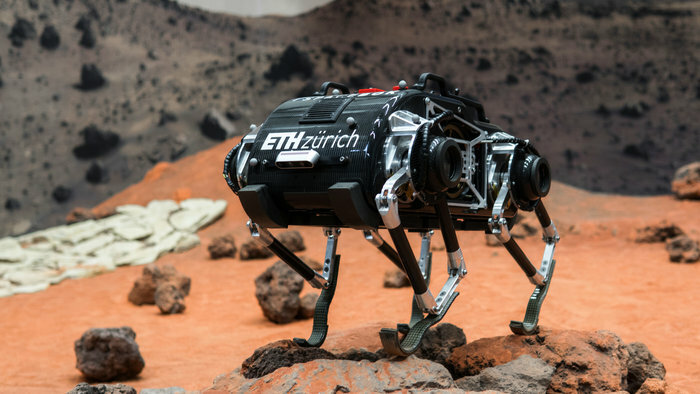 But I really enjoyed reading about this new walking and hopping SpaceBok robot – not a toy, but a real planetary explorer – which the European Space Agency (ESA) is now helping to support, in conjunction with ETH Zurich and ZHAW Zurich University. ESA said this week it’s testing this robot in its Mars Yard – a 26-feet-square (8-meter-square) “sandbox,” filled with different sizes of sand, gravel and rock – part of the Planetary Robotics Laboratory in Noordwijk, the Netherlands. Click here for pics of the Mars Yard. Legged robots can traverse unstructured terrain and could be used to explore areas of interest, such as craters, which rovers are unable to reach. As they are very versatile, they can change gait to adapt to different terrain. In contrast to other legged robots, SpaceBok is primarily built for hopping. While this is not particularly useful on Earth, it could reach a height of four metres on the moon. This would allow for a fast and efficient way of moving forward. We are currently implementing and testing vision sensors, to increase SpaceBok’s autonomy and robustness. Not convinced yet that the SpaceBok robot is cool? Try this video! Can’t wait to show it to my grandson! Bottom line: ESA is testing its SpaceBok robot as a possible moon or Mars explorer.